Q.1 What is the taxable event under GST? Q.2 What is the scope of ‘supply’ under the GST law? Q.3 What is a taxable supply? Q.4 What are the necessary elements that constitute supply under CGST/SGST Act? Q.5 Can a transaction in which any one or more of the above criteria is not fulfilled, be still considered as supply under GST? Q.6 Import of Goods is conspicuous by its absence in Section 7. Why? Q.7 Are self-supplies taxable under GST? Q.8 Whether transfer of title and/or possession is necessary for a transaction to constitute supply of goods? Q.9 What do you mean by “supply made in the course or furtherance of business”? Q.10 An individual buys a car for personal use and after a year sells it to a car dealer. Will the transaction be a supply in terms of CGST/SGST Act? Give reasons for the answer. Q.11 A dealer of air-conditioners p e r m a n e n t l y transfers an air conditioner from his stock in trade, for personal use at his residence. Will the transaction constitute a supply? Q.12 Whether provision of service or goods by a club or association or society to its members will be treated as supply or not? Q.13 What are the different types of supplies under the GST law? Q.14 What are inter-state supplies and intra-state supplies? Q.15 Whether transfer of right to use goods will be treated as supply of goods or supply of service? Why? Q.16 Whether Works contracts and Catering services will be treated as supply of goods or supply of services? Why? Q.17 Whether supply of software would be treated as supply of goods or supply of services under GST law? Q.18 Whether goods supplied on hire purchase basis will be treated as supply of goods or supply of services? Why? Q.19 Are there any activities which are treated as neither a supply of goods nor a supply of services? Q.20 What is meant by zero rated supply under GST? Q.21 Will import of services without consideration be taxable under GST? Q.22 What is a Composite Supply under CGST/ SGST/UTGST Act? Q.23 How will tax liability on a composite supply be determined under GST? Q.24 What is a mixed supply? Q.25 How will tax liability on a mixed supply be determined under GST? Q.26 Whether retreading of tyres is a supply of goods or services? Q.27 Whether activity of bus body building, is a supply of goods or services? Q.28 Whether foods supplied to the patients as part of the healthcare services in hospitals taxable? Q.29 Is the reverse charge mechanism applicable only to services? Q.30 What are the supplies of goods under RCM? Q.31 Whether insurance service is under reverse charge? Ans. The taxable event under GST shall be the supply of goods or services or both made for consideration in the course or furtherance of business. The taxable events under the existing indirect tax laws such as manufacture, sale, or provision of services shall stand subsumed in the taxable event known as ‘supply’. Ans. The term ‘supply’ is wide in its import covers all forms of supply of goods or services or both that includes sale, transfer, barter, exchange, license, rental, lease or disposal made or agreed to be made for a consideration by a person in the course or furtherance of business. It also includes import of service. The GST law also provides for including certain transactions made without consideration within the scope of supply. Ans. A ‘taxable supply’ means a supply of goods or services or both which is chargeable to goods and services tax under the GST Act. (v) the supply is made by a taxable person. Ans. Yes. Under certain circumstances such as import of services for a consideration whether or not in the course or furtherance of business (Section 7(1) (b)) or supplies made without consideration, specified under Schedule-I of CGST /SGST Act, where one or more ingredients specified in answer to question no.4 are not satisfied, it shall still be treated as supply for levy of GST. Ans. Import of goods is dealt separately under the Customs Act, 1962, wherein IGST and compensation cess (wherever applicable) shall be levied under the Customs Tariff Act, 1975 in addition to basic customs duty. Proviso to section 5(1) of IGST Act, 2017 may be referred to. Ans. Inter-state self-supplies such as stock transfers, branch transfers or consignment sales shall be taxable under IGST even though such transactions may not involve payment of consideration. Every supplier is liable to register under the GST law in the State or Union territory from where he makes a taxable supply of goods or services or both in terms of Section 22 of the CGST Act. However, intra-state self-supplies are not taxable subject to not opting for registration as business vertical. Ans. Title as well as possession both have to be transferred for a transaction to be considered as a supply of goods. In case title is not transferred, the transaction would be treated as supply of service in terms of Schedule II (1) (b). In some cases, possession may be transferred immediately but title may be transferred at a future date like in case of sale on approval basis or hire purchase arrangement. Such transactions will also be termed as supply of goods. Ans. “Business” is defined under Section 2(17) include any trade, commerce, manufacture, profession, vocation, adventure or wager etc. whether or not undertaken for a pecuniary benefit. Business also includes any activity or transaction which is incidental or ancillary to the aforementioned listed activities. In addition, any activity undertaken by the Central Govt. or a State Govt. or any local authority in which they are engaged as public authority shall also be construed as business. From the above, it may be noted that any activity undertaken included in the definition for furtherance or promoting of a business could constitute a supply under GST law. Ans. No, because the sale of old and used car by an individual is not in the course or furtherance of business and hence does not constitute supply. Ans. Yes. As per Sl. No.1 of Schedule-I, permanent transfer or disposal of business assets where input tax credit has been availed on such assets shall constitute a supply under GST even where no consideration is involved. Ans. Yes. Provision of facilities by a club, association, society or any such body to its members shall be treated as supply. This is included in the definition of ‘business’ in section 2(17) of CGST/SGST Act. Ans. (i) Taxable and exempt supplies. (ii) Inter-State and Intra-State supplies, (iii) Composite and mixed supplies and (iv) Zero rated supplies. Ans. Inter-state and intra-state supplies have specifically been defined in Section 7(1), 7(2) and 8(1), 8(2) of the IGST Act respectively. Broadly, where the location of the supplier and the place of supply are in same state it will be intra-state and where it is in different states it will be inter-state supplies. Ans. Transfer of right to use goods shall be treated as supply of service because there is no transfer of title in such supplies. Such transactions are specifically treated as supply of service in Schedule-II of CGST/SGST Act. Ans. Works contracts and catering services shall be treated as supply of services as both are specified under Sl. No. 6 (a) and (b) in Schedule-II of the GST law. Ans. Development, design, programming, customization, adaptation, upgradation, enhancement, implementation of information technology software shall be treated as supply of services as listed in Sl. No. 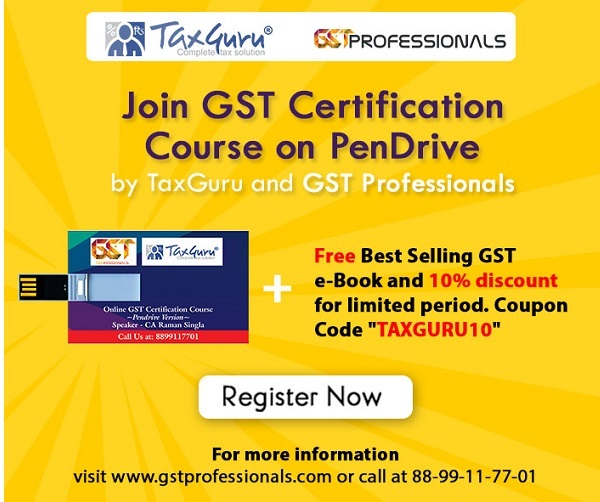 5 (2)(d) of Schedule –II of the GST law. Schedule-III of the GST law lists certain activities such as (i) services by an employee to the employer in the course of or in relation to his employment, (ii) services by any Court or Tribunal established under any law, (iii) functions performed by members of Parliament, State Legislatures, members of the local authorities, Constitutional functionaries (iv) services of funeral, burial, crematorium or mortuary and (v) sale of land and (vi), actionable claims other than lottery, betting and gambling shall be treated neither a supply of goods or supply of services. Merchant Trading or Out and Out transactions: Supply of goods from a place in the non-taxable territory to another place in the non-taxable territory without such goods entering into India. Ans. Zero rated supply means export of goods and/or services or supply of goods and/or services to a SEZ developer or a SEZ Unit. Ans. As a general principle, import of services without consideration will not be considered as supply under GST in terms of Section 7. However, import of services by a taxable person from a related person or from any of his other establishments outside India, in the course or furtherance of business, even without consideration will be treated as supply in terms of Sl. No.4 of Schedule I.
Ans. Composite Supply means a supply made by a taxable person to a recipient comprising two or more taxable supplies of goods or services, or any combination thereof, which are naturally bundled and supplied in conjunction with each other in the ordinary course of business, one of which is a principal supply. Principal supply has been defined in Section 2(90) of the CGST Act as supply of goods or services which constitutes the predominant element of a composite supply and to which any other supply forming part of that composite supply is ancillary. For example, where goods are packed and transported with insurance, the supply of goods, packing materials, transport and insurance is a composite supply and supply of goods is the principal supply. Ans. Mixed Supply means two or more individual supplies of goods or services or any combination thereof, made in conjunction with each other by a taxable person for a single price where such supply does not constitute a composite supply. For example, a supply of package consisting of canned foods, sweets, chocolates, cakes, dry fruits, aerated drink and fruit juice when supplied for a single price is a mixed supply. Each of these items can be supplied separately and it is not dependent on any other. It shall not be a mixed supply if these items are supplied separately. Ans. A mixed supply comprising two or more supplies shall be treated as supply of that particular supply which attracts the highest rate of tax. Ans. In retreading of tyres, which is a composite supply, the pre-dominant element is the process of retreading which is a supply of service. Rubber used for retreading is an ancillary supply. Therefore, it is a supply of service. Ans. The classification would depend on which supply is the principal supply. In case, a bus body building company builds on the chassis owned by it and sells the completely built buses, it would be supply of goods. On the other hand, if the company builds the body on the chassis belonging to some else, it would be supply of services. Ans. Health care services provided by the clinical establishments will include food supplied to the patients. Therefore, food supplied to the in-patients as advised by the doctor/nutritionists is a part of composite supply of healthcare and not separately taxable. However, other supplies of food by a hospital to patients (not admitted) or their attendants or visitors are taxable. Ans. No, reverse charge applies to supplies of both goods and services, as notified by the Government on the recommendations of the GST Council. Notification no. 4/2017-Central Tax (Rate) dated 28/06/2017 as amended by notification no. 43/2017-Central Tax (Rate) dated 14/11/2017 & notification no.11/2018-Central Tax (Rate) dated 28/05/2018 and 13/2017- Central Tax (Rate) dated 28/06/2017 as amended by notification no. 33/2017-Central Tax (Rate) dated 13/10/2017 & notification no.03/2018-Central Tax (Rate) dated 25/01/2018 have been issued. Similar notifications have been issued under IGST Act also. Reverse charge also applies to supplies received by a registered person from unregistered persons. However, the provision of reverse charge liability on supplies received from unregistered persons, as provided in sections 9 (4) and 5 (4) of the CGST Act and the IGST Act respectively, have been kept in abeyance till 30.09.2019. Further as the recent CGST (Amendment) Act, 2018, section 9(4) shall only be applicable for specified class of registered persons which shall be notified by the government. However, the notification to bring the Act into effect is yet to be issued. 4A Raw cotton Agriculturist Any registered person. Ans. Service supplied by an “insurance agent” to any person carrying on insurance business, located in taxable territory is under the reverse charge mechanism. The Notification No. 3/2018- Central Tax (Rate) dated 25th January, 2018 defines “insurance agent” and takes the meaning from section 2(10) of the Insurance Act, 1938. The insurance agent and corporate agent have different meaning and connotation in the insurance industry as well as under the insurance Act, 1938. The corporate agents along with insurance brokers, re-insurance brokers, insurance consultants, third party administrator, surveyors and loss assessors etc. are categorized as “insurance intermediary” and get excluded from reverse charge mechanism. They can pay GST under forward charge and claim input tax credit thereby avoiding cascading. Only individuals are covered under the reverse charge mechanism as “insurance agent”. Please let us know whether we can send our finished goods for further job work to any other registered manufacturer?